Oh You Social Butterfly, You! I guess maybe I’m showing my age when I use the term “social butterfly.” I haven’t heard it used in a while. We all know one, that person that shows up to a party or a networking event and spends the entire time flitting about, from person to person (or flower to flower), landing very lightly, then moving along without staying long. Although beautiful to watch, it is hard to put into words the impression left by the butterfly, they are there for such a brief period of time. 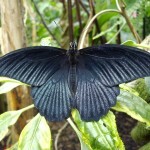 With the social butterfly we find it difficult to recall much about them, other than they were there. And if you’re not using social media like Facebook, MySpace, Twitter, Digg or any one of a number of other social/community based sites, then you are missing out on major venues with which you can nurture and improve your brand. There is a catch though. I brought up the analogy of the butterfly to illustrate a personal observation I have made experiencing what some social marketers (and microbloggers) do with their comments. I find that I have favorites that I always read; people whose blogs or comments are especially helpful or thought provoking, or who I even find humorous and therefore I bookmark them, share them, subscribe to them or request their RSS feeds. Seth Godin is a good example. It is these people who in my mind have established a brand awareness, an image that is positive and one that is easy for me to recall. These are people I would purchase from. On the other end of the spectrum are those who don’t really have much to say; all of their comments centering around what small event is taking place in their lives, or who is making them mad or just general bitching. I’ve even read comments that made no sense at all. Joel Comm in his book “Twitter Power” encourages the use of tweets that aren’t always about marketing yourself and your brand and are more an effort to show yourself a real and genuine person, a human being with concerns, wants and desires. And I couldn’t agree more. I believe that it is variety that adds spice to life. Social commentary should reflect this variety by containing a rich mixture of personal anecdotes, observations, references and valuable information. I believe that by providing value, be it new information, a provocative thought, quotes from bright people or even a good recipe, you can go a long way towards building a brand that people will remember. Tony Hsieh, CEO of Zappos, not only promotes his company but also builds a personal brand through the tweets he sends. It is possible to have your own personal style and solid marketing principals at the same time. Brands try to increase awareness and considerations to purchase, hopefully resulting in a sale. But the social butterfly, whose impression with us is barely memorable, cannot possibly build much awareness. They are here and then gone. Previous PostIt’s Just Touch and GoNext PostIs This a “Teachable Moment” Chicago Cubs? I am a regular reader of your blog posts. I liked the recent one and other posts on your blog so much that I have subscribed to the blog’s RSS feed in Thunderbird. Even thinking of stealing some ideas and put them to work. Keep all the good work going by posting more informative posts. Thank you. Time well spent on this post. This is a perfect read and I completely understand where you are coming from in the fourth section. Informative post, I’ll be sure to follow the other articles. I feel super glad after I saw this webpage! I do feel really happy after I discovered this website! very nice blog, keep it up, will share this to others.